The driver's seat should be adjusted in such a way that the pedals can be fully pressed to the floor with slightly bent legs. The seat backrest on the driver's seat should be adjusted in such a way that the upper point of the steering wheel can be easily reached with slightly bent arms. 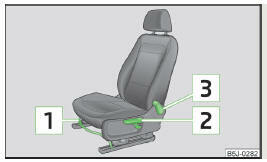 Correct adjustment of the seats is particularly important for the following reasons. Reaching the controls safely and quickly. A relaxed and fatigue-free body position. Achieving the maximum protection offered by the seat belts and the airbag system. Only adjust the driver's seat when the vehicle is stationary – there is the risk of an accident. Caution when adjusting the seat! You may suffer injuries or bruises as a result of adjusting the seat without paying proper attention. Never carry more people than the number of seats in the vehicle. Do not transport any objects on the front passenger seat other than objects (e.g. child safety seat) intended for this purpose – there is the risk of an accident. After a certain time, play can develop within the adjustment mechanism of the backrest angle. Pull lever 1 » Fig. 54 up and push the seat into the desired position. Release the lever 1 and push the seat until the lock clicks into place. To lift the seat, pull or pump lever 2 » Fig. 54 upwards. To lower the seat, push or pump the lever 2 downwards. To adjust the angle of the backrest, relieve any pressure from the seat backrest (do not lean on it) and turn handwheel 3 » Fig. 54. Pull the lever (in the middle) 1 » Fig. 55 up and push the seat to the desired position. To lift the seat, pull or pump lever 2 » Fig. 55 upwards. Relieve the load on the seat backrest (do not lean on it), pull the lever 3 » Fig. 55 towards the rear and set the desired angle of the seat backrest with the back. After releasing the lever 3 , the seat backrest will remain in the set position. 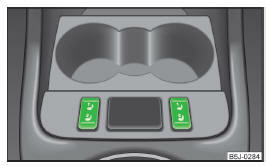 The seat backrests and seats can be heated electrically. 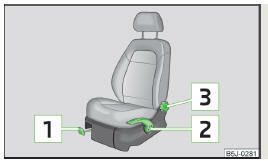 Switch the front seat heating to 25 % or 100 % power by pressing rocker switch at position 1 or 2 » Fig. 56. To switch off the heating shift the rocker switch into the horizontal position. If, as an occupant, you have a subdued pain and/or temperature sensitivity, e.g. through medication, paralysis or because of chronic illness (e.g. diabetes), we recommend not to use the seat heating. This can lead to burns on the back, the posterior and the legs which are difficult to heal. If the seat heating is used, we recommend to make regular breaks in your journey when driving long distances, so that the body can recuperate from the stress of the journey. Please consult your doctor, who can evaluate your specific condition. Do not kneel on the seats or otherwise apply pressure at specific points to avoid damaging the heating elements for the seat heaters. Do not turn on the seat heater if seats are not occupied. Do not switch on the seat heating if the seats have objects attached to or placed on them, for example a child seat, a bag, etc. A fault of the heating elements in the seat heating can occur. If additional seat covers or protective covers are attached to the seats, do not turn on the seat heater - there is a risk of damaging the seat covers and seat heating. Do not clean the seats using moisture » page 135. The seat heating should only be switched on when the engine is running. This has a significant effect of saving on the battery capacity. If the on-board voltage drops, the seat heating is switched off automatically, in order to provide sufficient electrical energy for the engine control » page 150, Automatic load deactivation.